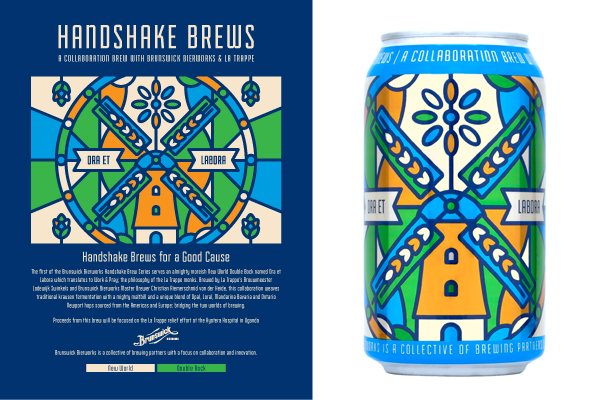 Limited and now available in cans in the U.S., proceeds benefit La Trappe’s relief effort at the Kyotera Hospital in Uganda. North America (December 5, 2017) – Trappist Brewery Koningshoeven, better known as La Trappe, has produced its first ever collaboration beer Ora et Labora with Brunswick Bierworks. The beer was produced in Toronto as the first of the Brunswick Bierworks Handshake Brews series. Ora et Labora translates as “Pray and Work”, which is the creed of the Trappist Monks. The beer is a stern 7.5% ABV “New World Double Bock” and was brewed by La Trappe’s brouwmeester Lodewijk Swinkels alongside Brunswick Bierworks master brewer Christian Riemerschmid von der Heide. The collaboration weaves traditional krausen fermentation with a mighty maltbill and a unique blend of Opal, Loral, Mandarina Bavaria and Ontario Newport hops sourced from the Americas and Europe; bridging the two worlds of brewing. The recipe that Lodewijk and Christian have designed is “double bock” in strength. The ingredients and process with re-fermentation is like a wheat double bock – however the fermentation and yeast is like grand cru. La Trappe is honored to donate proceeds from sales to the Kyotera project, its relief effort for the Kyotera Hospital in Uganda. Do you manage a restaurant, bar or retail store and are interested in selling Ora et Labora? Interested in becoming a distribution partner for La Trappe? Please contact Lanny Hoff with interest. For interview opportunities with La Trappe or for more information about Ora et Labora and the Kyotera project, please contact Lanny Hoff at +1 (612) 245-5433 or by email at lanny.hoff@artisanalimports.com. About Trappist Brewery Koningshoeven: Founded by Trappist monks in 1884, Trappist Brewery Koningshoeven “La Trappe” has been crafting the finest Trappist ales for over two centuries. Learn more about the brewery at www.latrappetrappist.com. About Brunswick Bierworks: Brunswick Bierworks is dedicated to local and global brewery partners to help produce high-quality, small to medium batch beer for the Canadian and North American markets. Brewery partners receive direct access to national and international markets with fresh product, brewed to exact specifications under the supervision of your brewery’s brewmaster. Learn more at www.brunswickbierworks.com.